Devotees of Sri Gokarna Mutt carried out the cleanliness drive in Car Street area using an earth mover and a tipper. Construction debris lying in the area for several months were thoroughly cleaned. Devotees of Sri Kshetra Kolya and others carried out ‘Swachh Kolya,’ wherein hundreds of devotees volunteered in removing plastic waste from Kolya area. Near St. Agnes College, students of Sahyadri Engineering College cleaned all the three sides of St. Agnes College Circle. Members of Sharada Mahila Vrinda cleaned the surroundings of Mangala Nagar and the surroundings ofin Ramakrishna Mutt. At Karangalpady, the surroundings of Jal Road and Subrahamnya Sadana were thoroughly cleaned. The drive was conducted in front of BGS School in Kavoor, where both sides of Kulur-Kavoor Road were cleaned. The volunteers also renovated and repainted the neglected bus shelter there. About 80 volunteers, including Derebail residents and members of Bhagyajyothi Seva Samiti, took up brooms in and around Derebail. At the same time, volunteers from ‘Friends For Ever’ carried out a cleanliness drive at Airport Road, Yeyyadi and surrounding areas. At Thokkottu, members of Sri Paramjyothi Manava Seva Samiti, devotes of Sri Uma Maheshwari Temple, and members of Sri Veera Maruti Vyayama Shale carried out the cleanliness drive. ‘Swachh Mangalagangothri’ was carried out at the Mangalore University campus at Konaje by hundreds of university students. Members of Sri Matridhama Seva Samiti carried out ‘Swachh Landlinks for Swacch Mangaluru’ at Landlinks-Derebail. Deralakatte area was cleaned by volunteers in association with the Justice K.S. Hegde Medical Academy. About 200 medical and paramedical students of the institute participated in the drive. 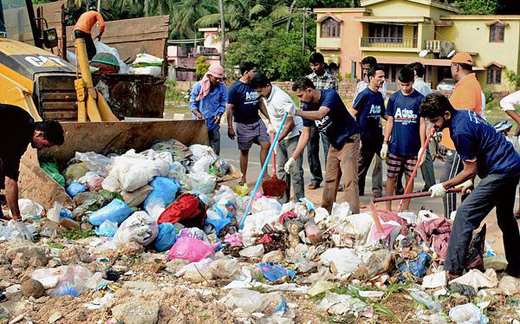 Students of Srinivasa Institute of Technology and residents from seven villages around Merlapadavu near Valachil carried out a cleanliness drive around Merlapadavu.